Engaging the digital natives isn’t as daunting as you think. Here’s how three classrooms do it. Pete Episcopo had a vision. When he started at Brevard Public Schools in Viera, Florida, the digital-media artist wanted to share his love of all things digital and teach essential 21st-century skills so students could be better prepared for post-secondary education after high school. After filling in for a teacher and “transforming the class” by teaching PhotoShop, Illustrator and InDesign, he spent the summer creating a visual-design curriculum, and now his classes are among the district’s most popular. Episcopo’s students learn to use online photo libraries, scan images, take digital photos, edit audio and video files and master the world of digital storytelling with Adobe Creative Suite technology. To expand the program, he helped the district hire graphic designer Barbara Fine, who teaches communications technology at Palm Bay High School. In her classes, students work in teams on projects similar to the jobs designers do. For instance, they design logos, letterheads, advertisements and home pages—what are collectively known as an identity package—for clients. They create magazine covers and movie posters and have even designed their own fonts. “The classes have exploded. Unfortunately, I have to turn students away,” Fine says. Students in the digital-media classes build electronic portfolios and create Web sites to showcase their work. Eventually, they can use the portfolios to woo potential employers. Episcopo has begun asking students to track the steps they take so they can explain to their peers how they work. As the program continues to expand, Fine plans to teach about industry careers and essential interview skills. In addition, the Viera High School academy will feature television and film production next year. Fourth-year students will take broadcasting classes while filming their senior year for a DVD that will be bundled into the yearbook. The Web site of Episcopo’s class is at http://web.mac.com/backyardsky. Assessment is always of concern. How do you move from individual, isolated assessments to evaluating collaborative, creative projects? Montagne is looking to fine-arts educators for a potential solution and believes he will at some point move toward a portfolio model. But then he’d miss out on the opportunities he’s had to connect with other educators interested in 21st-century learning through Ning, Facebook and other online platforms. For information on the projects at Taft’s school, go to 21stcenturytoolsncss.wikispaces.com/examples. To some, Franklin High School in Franklin, Texas, may seem like a long way from everywhere. But thanks to an arsenal of hardware and software, Jill Patton’s ninth-grade world-geography classroom is actually right in the middle of it all. 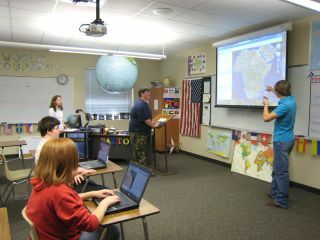 One of her favorite lessons involves letting students play an interactive online mapping game. “Using cordless mice, students go to a Web site, pick a continent and fit the country pieces into the right spots,” she says. The Web site helps them corrects their mistakes, saying, for example, “You’re off by 200 miles.” By using several modalities, the students learn the information more thoroughly, and, Patton says, their scores on map-identification tests are through the roof. “Teaching this way involves extra time on my part, but it’s worth it. They are glued to my every word in class,” she says. Although this has been her first full year with the upgraded technology, Patton already sees a huge difference in her students’ comprehension. “Hands down, they are doing better this year,” she says.